I hope you all had a lovely weekend and enjoyed the lovely weather we had! 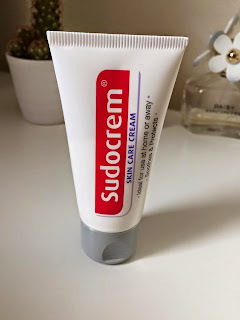 Today I have a review of the Sudocrem skincare cream. Satellite PR contacted me and asked if I would be interested in featuring Sudocrem on my blog. Firstly I was excited because my little blog was noticed and secondly I knew I had to do it. So I accepted the offer and they sent me a sample handbag size tube in return for featuring it on my blog. So i would like to first of all thank Satellite PR for this opportunity. When I was around 13/14 years old I was in my first couple of years in secondary school and I started to get teenage ache. During my time at secondary school I was always very insecure and image conscious. My acne was really bad and it made me really depressed. I then went to the doctors and I was prescribed medication, I had to take two tablets twice a day. I was taking them everyday to a month and my acne didn't get any better. So I stopped taking them. My older sister Rochelle then recommended Sudocrem I was sceptical at first but I would have tried anything to sort out my acne. I used it for about two weeks and saw amazing changes in my skin my spots were slowly clearing. I don't know why I stopped using it but I have now rekindled my love for it! - Facemask: Apply a thin layer of Sudocrem over your face and wear as an over night mask and you will wakeup with a gorgeous healthy glow. - Moisturiser: Sudocrem is an amazing moisturiser as it contains Zinc Oxide which helps prevent moisture loss. I have oily skin and it worked great for me so I think it will work well with all skin types. If you have spot prone skin and have tried lots of different things which haven't worked for you I highly recommend Sudocrem it worked wanders for me! Check it out and I would love to know your thoughts. Please like, follow and comment your holy grail skincare product. Congrats on getting noticed! That is a huge deal!